The lovely manager of this new location was kind enough to invite me in for a tasting a couple of weeks ago and I finally had a chance to stop by today. 55 sunny degrees in February in NYC made for a pretty crowded afternoon with the seats filled mostly with Upper East Side moms and their kids. will definitely be used soon. I have to say, this is the end of yogurt at Pinkberry for me. I would be shocked if it’s not closed within the next few months since it’s on the same block. This place is FAR superior. The choices alone make it an easy choice, not to mention the fact that the yogurt is much creamier, the flavors more exciting and the atmosphere more accommodating than their tiny competitor. I sampled a bunch of different flavors, some low-fat and some non-fat and was pretty impressed with all of them. I anticipated a similarly chemically taste to tasti-delight (1/2 a block away), but these were surprisingly authentic and pure tasting. My favorites were the pistachio and the birthday cake. Knowing that they change out the flavors frequently, it will be fun to go back to try some other options. 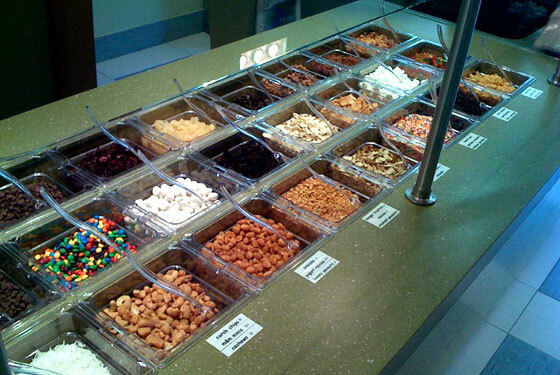 The toppings bar is extensive and appealing. Just about anything you can imagine was there. There should be a warning sign though…I imagine a lot of people think they are making a relatively healthy choice by going for fro-yo instead of ice cream, but then they load on cookies, chocolate, candy etc and by then it’s probably approximately 800 calories worth. It is kind of funny to see adults like kids-in-the-candy store at the bar though. Watching people loading on a little of everything was totally amusing. I was really temped by the little squares of rainbow cake (one of my favorite things in the world) but this time just wanted to taste the yogurt by itself to really be able to evaluate it. Next time, bring on the myriad toppings! I’ll be back soon…especially if the weather stays this spring-like.